Terrified of competition from a 7-year-old boy operating a makeshift lemonade stand, a group of vendors at the Saratoga County Fair in upstate Ballston Spa whined to a state health inspector that the child had no permit to sell refreshments from his family’s front porch just outside the fairgrounds. As a kid, he was also undercutting the vendors’ pricey drinks by almost 90 percent, selling lemonade for a mere 75 cents, instead of the $7 per cup charged inside the fairgrounds. He was also selling Sno-cones, sodas and bottled water at $1 each. 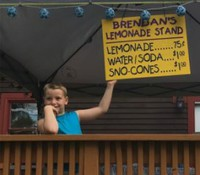 On Friday, July 27, a state health inspector showed up at the home and announced soon-to-be second-grader Brendan Mulvaney was breaking the law because he didn’t have a permit to sell refreshments and promptly shut down the stand. Sean Mulvaney, Brendan’s dad, was livid. “Yesterday, they issue an apology and today I need a permit,” he fumed. The permit costs $30 and is good for a year. Holmes said the DOH would expedite any application from the Mulvaneys. By Saturday, August 18, the young entrepreneur was back in business and raked in $946 to benefit a local 12-year-old battling a rare bone disease. His sour experience behind him, Brendan told The Times he was happy to be back in business and plans on doing the same thing again next summer. “It’s important to people to have something that is delicious,” he added. Sources: Aaron Feis, The New York Post, August 19, 2018, and Nolan Hicks, The New York Post, July 30, 2018. This is another example of government totally out of control. I'm glad you pointed out that the state senator who came to the kid's rescue was Republican. I'm sure the Democrats all wanted the kid's lemonade stand shut down because he was setting a bad example by working.